I grew up in a mid-century-modern house, one of many in my middle-class Canadian neighbourhood with an average household consisting of two professional parents, 2.3 children, and a housekeeper. The exception to this rule was the mid-forties farmhouse next door to me. My neighbour’s family structure was different. The parents spoke with accents, and there was a set of grandparents who didn’t speak English at all. Whenever I knocked on the kitchen door I was welcomed in by the mum and served sugary-sweet goodies, which were in short supply at my house. My neighbour’s mum, and grandparents were from Budapest. I had no clue where this was, but I thought it must be the most exotic place on earth. I have to meet a colleague in Budapest next month, announced Arthur, one day out of the blue. I’m coming with you! I said and booked us an apartment in an old-world building. No hotels for me on this trip, I wanted Hungarian neighbours. I determined to be more local and less tourist as the city emerged to take shape from the hazy imaginings of an eight-year-old. 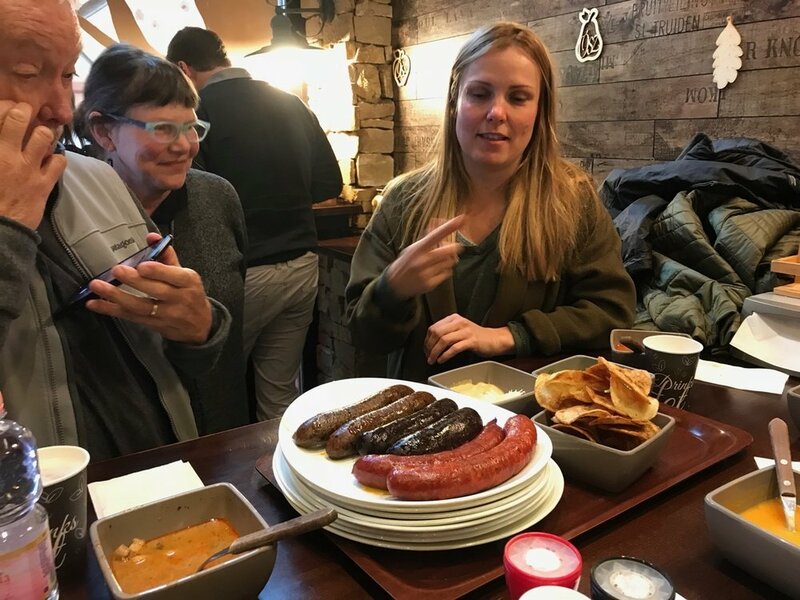 The first thing I did was sign up for a food tour, because, if you are going to be a local, you need to know what to eat. My tour started at ten in the morning at the iconic Great Market Hall, a cavernous brick building built in 1897, which happened to be right next door to my apartment. We’ll start over here! Bellowed Eva, our thirty-something guide. Swaths of people queued at kiosks serving steaming platters of chicken paprikash, trays of cabbage rolls, and vats of goulash. Eva parked our group of seven around a tall table and disappeared into the crowd. 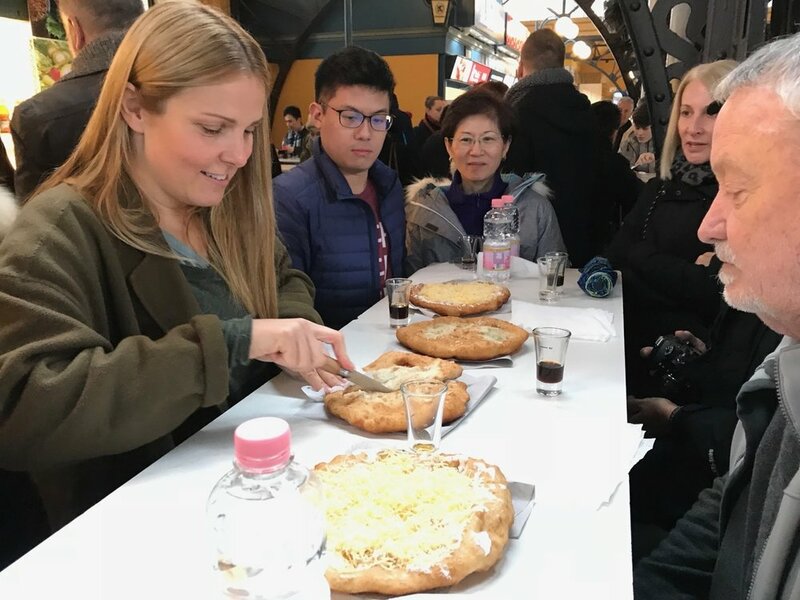 She emerged a minute later with two large disks of golden deep-fried yeasty flatbread, one topped with butter and fresh garlic, the other with finely grated cheese. Lángos. A moment later a vendor plonked a green bottle labeled with a red-cross symbol onto our table along with some shot glasses. 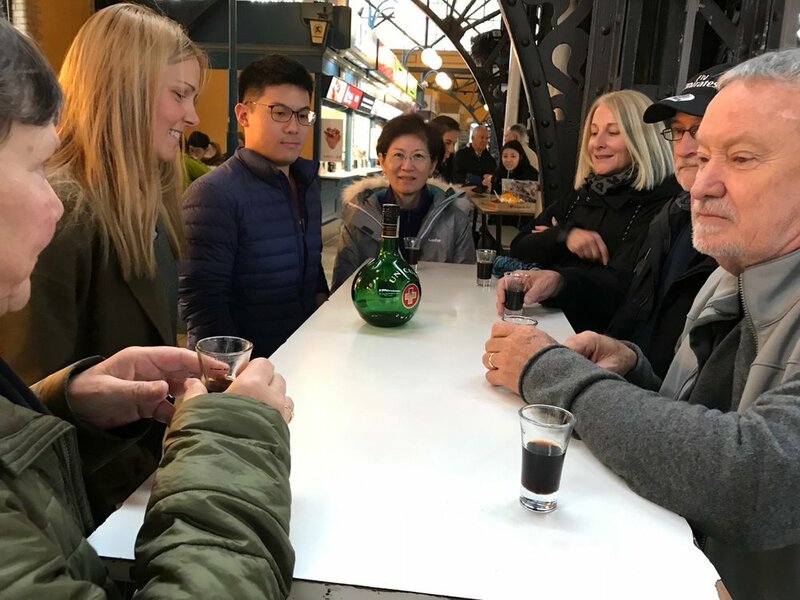 Unicum, we learned, is an herbal liquor particular to Hungary, and know to heal all ills. All of them. Everything. Well, if this is the way Hungarians start the day, count me in. I reached out and tore off a section of bread and washed it down with the brownish, bitter liqueur. Feeling thoroughly warm, and completely healed, the tour continued. 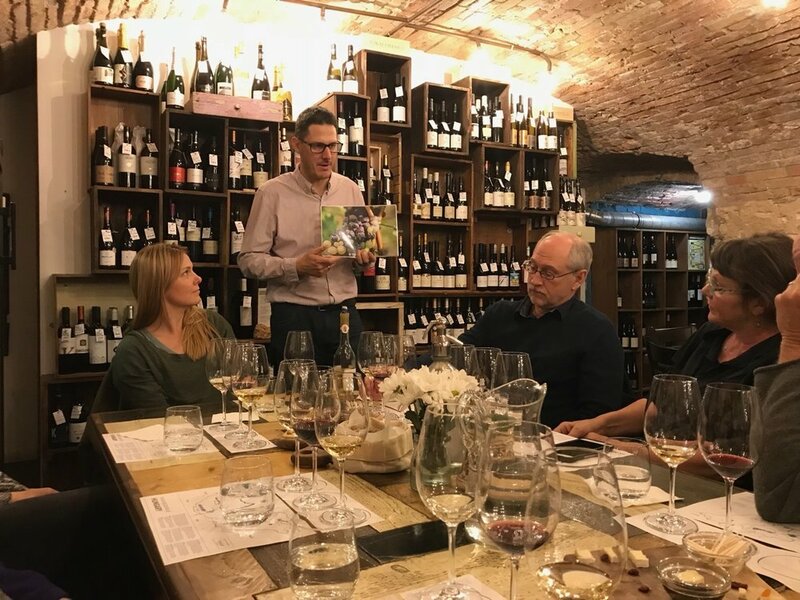 At one market stall, we ate poppy-seed strudel, at another, we were handed a sampler of charcuterie, where, in my endeavour to walk in the shoes of my neighbours who came before me, and possibly because of the Unicum, I ate horse. After this, we branched out into the city. Lunch was at a butcher shop with a name that translates something like, The Bleeding Pig, where I tasted bean and pork knuckle soup, paprikas sausage and pickled baby watermelon. At Café Central, a grand Viennese style coffee house dating to 1887, we were served Esterhazy Torte; layers of crisp meringue, ground nuts, and buttercream, and Dobos Torte; chocolate sponge-cake, buttercream and caramel, both invented in the mid-nineteenth century by Hungarian chefs. The day ended with a tasting of regional red, white and Tokaij wines, served with cheese, bread chunks, and toasted pumpkin seed oil. Okay, admittedly, the wine tasting bordered on touristy, but let’s just call it a crash course in the necessities of Hungarian life. 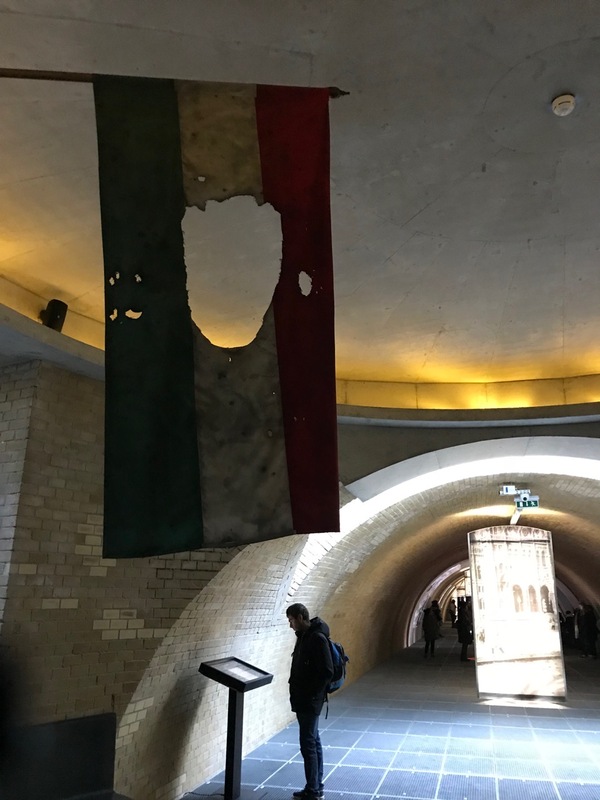 I was reading James Michener’s documentary book about the 1956 Hungarian Revolution, The Bridge at Andau, and using it as a historical guide to my city wanderings, connecting the dots of the uprising by visiting buildings, memorials, and museums. 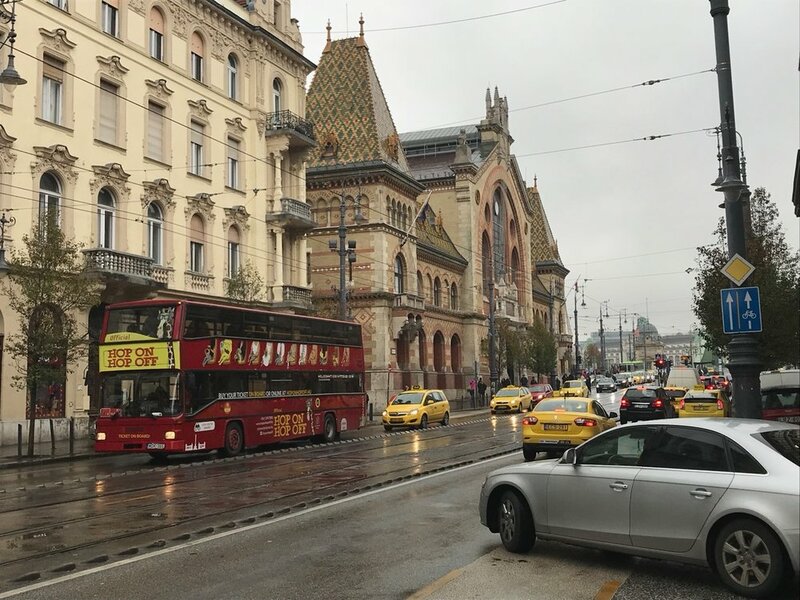 One day I jumped aboard Tram #2, and rumbled along the Danube embankment to Parliament. I had booked a tour, hoping to learn more about the complicated politics that had driven this country for the last century. My guide was a dud. She focussed on the gilded ceilings and stained-glass windows, and steered clear of political history. Back outside on Kossuth Lajos Square, feeling defeated, I spotted a staircase and followed it underground to a small memorial for the massacre of October 25, 1956. I watched a film about a survivor of the revolution telling his story. As a boy, he and his father were caught behind the pillars of the Agriculture building as bullets whizzed past. I walked back to the surface, and over to the Agriculture building where I stood behind a pillar, looking out at the now empty square, and I had an idea. Back at home, I typed an email …I want to know more about your family… I wrote to my childhood neighbour. He wrote back, telling me the story of his mother, traveling back to Hungary in 1956 to visit her parents with her young son, his brother. 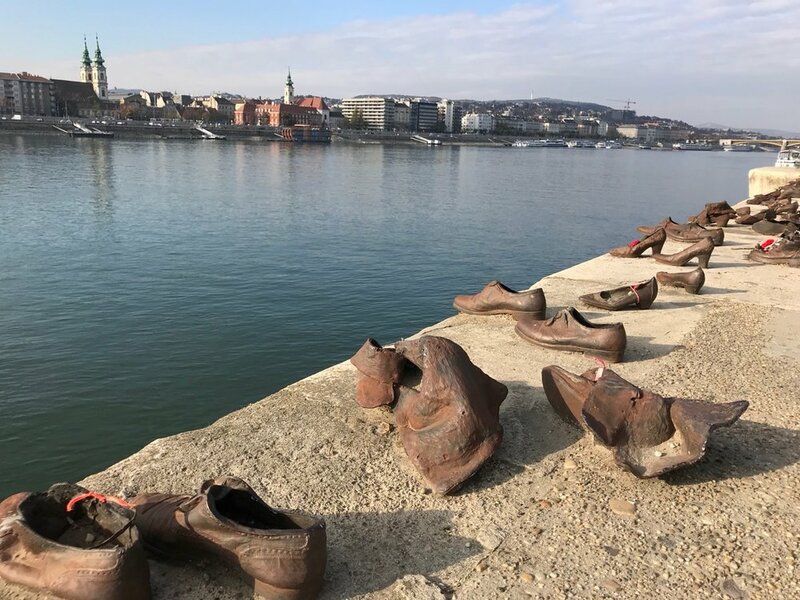 …the day they arrived in Budapest was the day the Revolution started. A group of students were protesting, and it grew to over 300,000 people. The people wanted out of the Warsaw pact and after a few days of protesting, started removing all the Russian symbols in Budapest. Instead of keeping order, the Hungarian army became part of the protests. The Russians were not going to put up with that and decided to send their tanks in to quell the uprising. They were very brutal and just massacred a lot of people. My Mom and Brother got caught up in that. The borders were closed, and nothing went in or out. That was the last my Dad heard from them. It would be weeks later that he would finally hear anything. My Dad was going crazy not knowing what was happening over there. He finally contacted Lester B. Pearson who was secretary of state at the time. Using his diplomatic pull, Pearson managed to get them out of Hungary. Wow. Note to self: Next time someone is serving you sugary-sweet goodies in her kitchen, ask her about her life. There was one more thing I had to do, and it was causing me no small amount of stress. If I was going to experience life in Budapest, public bathing could not be avoided. There are many public bath-houses to choose from, and I had narrowed it down to the three. Szechenyi, a few trams away, is the biggest and most popular complex with eighteen pools and all manner of water features. These co-ed baths date back a hundred years and are probably the least intimidating for me to don my bathing suit and splash around in relative obscurity for a few hours. But, I wasn’t going to let myself off the hook so easily. Would my neighbours take several trams to attend the baths? I’m guessing they would choose something more local. 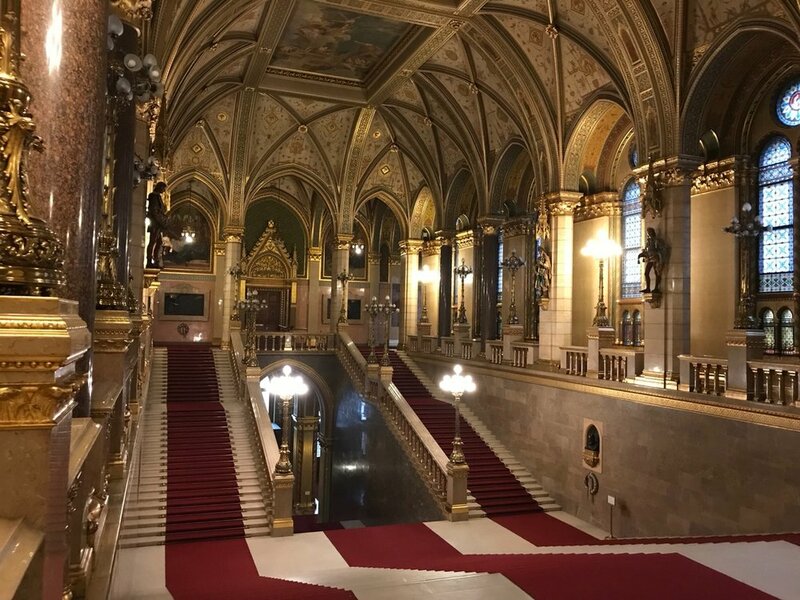 The Gellert Baths were closest to home, just 700 metres from my door, but they are more upscale than Szechenyi, and according to my guidebooks, more touristy. Not my baths. My 2005 guidebook announces the Rudas Baths, about a kilometer from home, as men only, but upon further research, I find that women have now been allotted Tuesdays. Rudas is a 500-year-old bathing-suit optional Turkish bath-house on the Danube embankment. The historical chamber is the same today as it was in the 16th century; a dimly-lit steamy, squat octagonal dome over a main pool about 10 metres in diameter. Four smaller dipping pools of varying temperatures surround the main pool. No swirl-pools, or water features here. Like Unicum, the baths can give you a jump-start back to health. The hot-spring feeding Rudas is radio-active (no, that is not a spelling mistake), and known to cure joint degeneration, herniated discs, calcium deficiency, and chronic arthritis. Leading up to Tuesday, I spent far too much time wondering if I would wear my bathing suit or not. As a matter of fact, as I walked across the Liberty Bridge, and along the river bank in a chilly drizzle, toward what seemed more like a prison sentence than a trip to the spa, I still wasn’t sure. My two-piece suit was safely rolled up in my towel as I entered and paid for my wrist-band that would let me into my personal changing cabin. An attendant handed me a flimsy white garment in the shape of a typical kitchen apron. I took it and kept in step with the group of women in front of me as we descended a winding staircase, and came to a room full of numbered wooden changing-cabins. Here, each woman disappeared all too quickly behind a door, and I found myself alone. I didn’t want to go in yet, mainly because, I wasn’t sure how to come out. I paced up and down until a cabin door opened and a white apron appeared. The woman was about 60 years old. 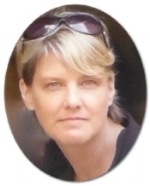 As she passed by, I crooked my neck and peered covertly around behind her. Right, undoubtedly no bathing suit there. A second woman passed by, maybe 40 years old, bathing bottoms only, and still a third, twentyish in a bikini. Looks like the choice was up to me, full bathing suit, half-clad, or birthday suit. I stepped into my cabin, made my choice, and stepped out a few minutes later, with my white apron tied neatly around my waist and neck, and loitered until I saw someone who clearly knew where she was going. The woman in question was grandmotherly, portly, and she carried her apron confidently in her left hand while marching stark naked through the change-room, the lounge area and into the octagonal bathing room where she descended into the main pool. Right. Here I go. I took off my apron and sunk into the steaming waters. I floated around a while and watched the scene. There were about 30 women in this pool, and a few people in each of the surrounding pools. Every so often, someone would stand up, and move in a clockwise fashion to the next perimeter pool. Most women were in pairs, or small groups, chatting away in Hungarian. The sounds got caught up somewhere in the dome and became a murmur, with no distinct words. I’d hazard a guess that I was the only tourist in the room. Were they onto me? I wondered, or was I passing as a local? I spent two hours at the baths, rotating through the pools. Back in my cabin, I changed into my clothes and looked at my face in the mirror – I did seem a bit more glowy, was it the radiation? I tossed my apron into the supplied bin and walked confidently out of the baths and into the fresh morning air. On the way past the Market Hall, I popped in and ordered breakfast; langos and a shot of Unicum. 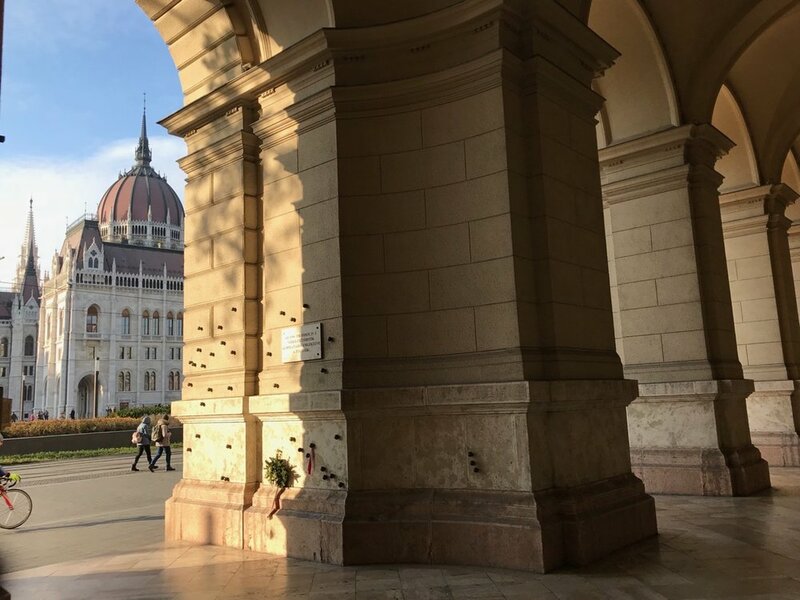 Hover over the images (or choose landscape on mobile) to see some pics of my Budapest break. 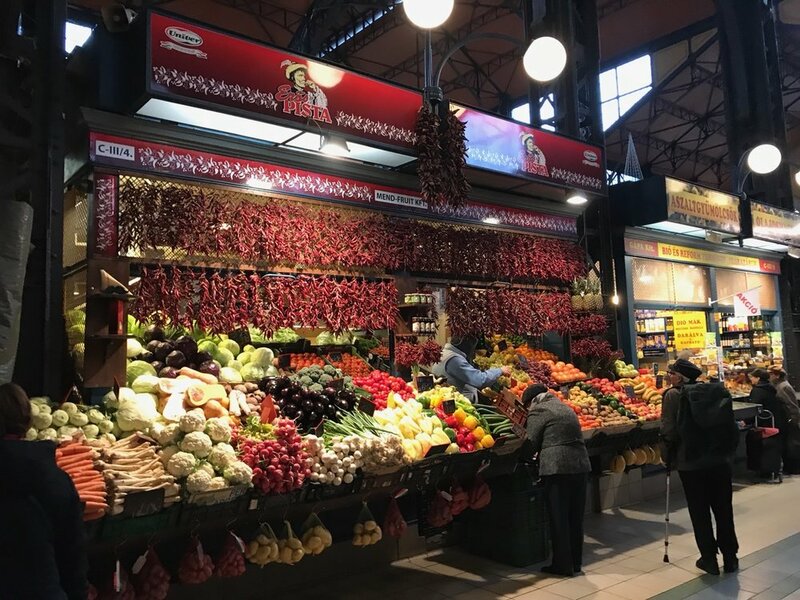 Locals continue to shop at the Great Market Hall, because prices are very competitive, and everything is fresh. I first experienced Langos at a market in the Carpathian Mountains in Transylvania, Romania, once a part of Hungary. I still dream about it. I chose the paprikas sausage and left the blood sausage for others, because, becoming local is a process. Dobos near the front, and at the back, my fave, Esterhazy. One has to know about their region after all. 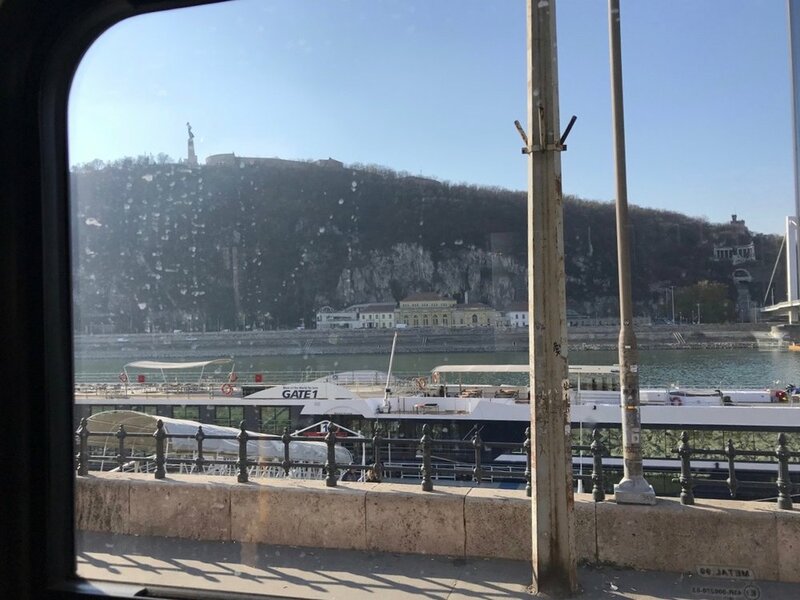 Tram #2 is recommended by National Geographic as one of the top 10 tram routes in the world, with vista’s over the wide Danube and the Buda Hills. For me, it was the most direct route to Parliament! 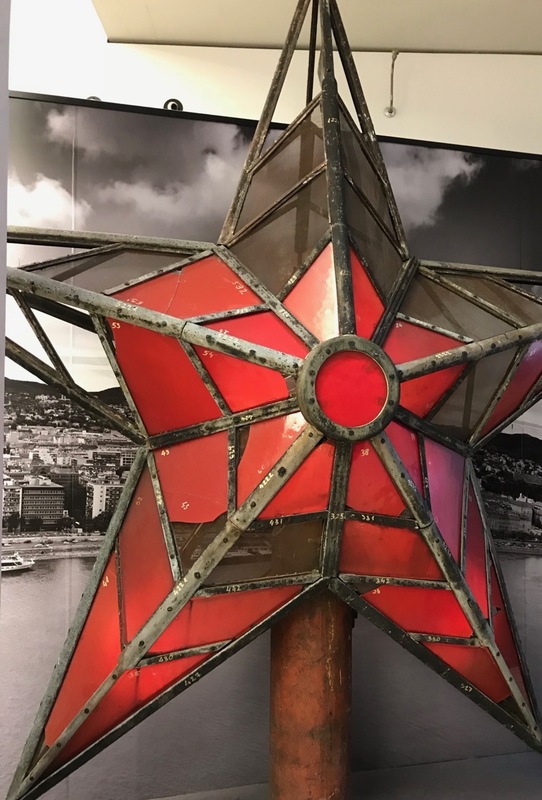 This massive star, that perched on top of the Parliament dome for four decades of communism, now dominates one corner of a small museum under the building. Here I stood, imagining the chaos. Metal plugs have been stamped into the pillars as a memorial of the bullets. A quick shot from Tram #2 of the Rudas baths on the Buda embankment. I lived on the third floor and exited through the courtyard to get to the street. When I needed a break from wandering the city, I stopped in this peoples cafe dating to 1952, where I could test more Esterhazy, and pair it with a cappuccino for under $5.00. From across the street from my apartment, the facade of the Great Market Hall is hard to miss.